This analysis of professional tennis continues to be true, perhaps even more so, at this year’s Australian Open, which I attended over winter break while seeing extended family in Australia. We arrived in the afternoon of the first day and began moving toward our seats in the Rod Laver Arena. As we walked, we passed a wide variety of popup stores, each with their own personal advertising twist. Barilla, the “Masters of Pasta,” had convinced Roger Federer of Switzerland to pour drops of olive oil onto some penne. The Happy Socks store, which originates from Sweden, contained many delightful different pairs of socks, all generally tennis-themed, but for some reason didn’t have quite so many cheerful customers. The same can be said for the adjacent Lululemon store. That first night, we saw the previous year’s champions—Caroline Wozniacki of Denmark and Federer—face off respectively against Alison Van Uytvanck of Belgium and Denis Istomin of Uzbekistan, who were unfortunate, but certainly not unsuspecting, opponents. Wozniacki dispensed the Belgian 6-3, 6-4, and Federer pulled off an easy 6-3, 6-4, 6-4. David Foster Wallace was also a fan of Federer, or at least an admirer of him. It is very difficult to avoid cliché in describing Federer, so I will only say that Federer always seems to be ahead of his opponent; his anticipation, his calculation, his shot-making are uncanny, and as a result most of his opponents have lost the battle before the match has even started. Wallace’s explanation of Federer’s success appears to be the only one that is comprehensible. Rafael Nadal of Spain, whom I saw practice, is one of the few players to consistently beat Federer. I suspect that Nadal possesses similar “preternatural” talents, but I would add that his raw physicality often overwhelms Federer (and nearly everyone else on tour). This praise is not to diminish Wozniacki in any way—the fact that she reached the U.S. Open Grand Slam finals twice before finally winning her first last year is a grand testament to her tenacity and determination. Yet the top players in the men’s game are essentially incomparable. Only Serena Williams (and Venus if you include doubles) matches up to the very best in the men’s game, and she has had a vastly more successful career than any member of the Big Four (Federer, Nadal, Novak Djokovic, Andy Murray). As it happened, Federer did end up losing, this time in the fourth round to the talented 20-year-old Stefanos Tsitsipas from Greece, the 14th seed, who defeated his idol 6-7(11), 7-6(3), 7-5, 7-6(5). Tsitsipas’s shots were penetrating and devastating. The Greek in part modeled his game on Federer, although Federer didn’t really see too many similarities (except for the long hair, a one-handed backhand, and eastern forehand grip). 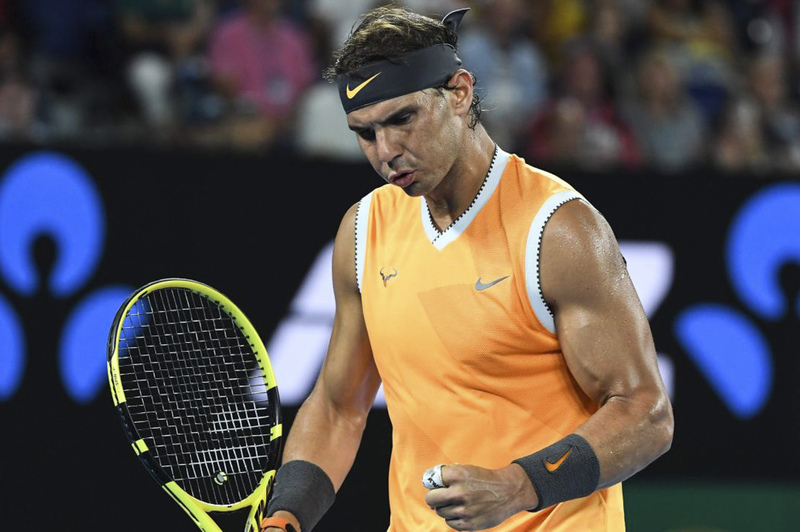 Nadal, the second seed, had no trouble with Tsitsipas, taking him out 6-3, 6-4, 6-2 in the semifinals. Another notable mention on the lower half of the men’s draw is American Frances Tiafoe, who, as the son of refugees from Sierra Leone, performed upsets over Kevin Anderson (fifth seed), Andreas Seppi (ranked 37th in the world), and Gregor Dimitrov (20th seed). But he too was handled easily in the quarterfinals by Nadal. On the top half of the men’s draw, the highest-ranked player in the world, Djokovic of Serbia, cruised through, playing 28th seed Lucas Pouille of France in the semifinals, who had taken out Milos Raonic, the 16th seed. In the women’s draw, the top half appeared to be another feasting ground for Serena Williams, but she was stopped short by Karolina Pliskova, the seventh seed from the Czech Republic, 6-4, 4-6, 7-5, in the quarterfinals. In the semifinals, reigning U.S. Open champion Naomi Osaka, seeded fourth, defeated Pliskova in similar fashion 6-2, 4-6, 6-4. On the lower half of the women’s draw, Australian favorite Ashleigh Barty, seeded 15th, reached the quarterfinals before falling to eighth seed Petra Kvitova, also from the Czech Republic. In the semifinals, Kvitova defeated American Danielle Collins, a former college player who had never won a grand slam before arriving in Australia this year. Collins has made headlines for her often frank and honest responses to interview questions, avoiding the banal responses which are just too ubiquitous among the top players of professional tennis. The women’s final, between Osaka and Kvitova, is set for the very early morning on Saturday. The men’s final, between Nadal and the winner of Djokovic and Pouille, will be on Sunday. Outside of the competition, sponsorships and advertising from China are becoming increasingly prominent, with the tournament even stylizing itself as “The Grand Slam of Asia/Pacific.” Luzhou Laojiao, a Chinese distillery, is one of three “associate partners” of the Australian Open, along with ANZ (Australia and New Zealand Banking Group) and Rolex. The fourth largest court is named 1573 Arena, after the distillery’s liquor Guojiao 1573. The official water of the tournament is Ganten Mineral Water, imported from Shenzhen and upsetting to some Australian conservative tabloid websites. One prominent Australian-based sponsorship appeared on every ball kid, who wore a matching Vegemite uniform. Despite the amount of money and sponsorship flowing around the tournament, the ball kids do not get paid. They do, however, get a certain amount of free food, free tickets, and a gift at the end of the tournament, which was a Go-Pro in 2018, according to the ball kid we met on the tram-ride home. The cherry on top of the gimme-capitalism at the Australian Open was the payment method. Although there were ATMs, some stores were card-only, courtesy of MasterCard. And nearly every single store (if I remember correctly) provided contactless payment, an economic innovation that has interestingly spread much more quickly to Europe and Australia than America. In Australia specifically, purchases under $100 (Australian dollars) do not require your PIN. The result is gleeful “carpe diem” consumerism, which makes you feel good for up to roughly 30 minutes after your purchase, at which point you realize what a mistake you have made (unless you, of course, used contactless payment to purchase alcohol). Watching tennis on TV back home in America, I realized how much more enjoyable the television makes this consumerism appear. In reality, it’s a discombobulated mess, but the occasional location shot that ESPN flashes up on screen implies a whimsical joy at being able to walk around and get whatever you desire. At the end of our second day at the tournament (we had purchased grounds passes in addition to the Rod Laver Arena seats), my family and I were sitting in the Aperol Spritz club, all holding corporatized happiness in our hands. Out of nowhere jumped out a Channel 9 cameraman, who told us we had a great “family vibe” and that he would love to get a shot of us. After much persistence, we relented for five seconds, with half the group smiling, half looking off into the distance with boredom. Although I really enjoyed the Australian Open, and I’d certainly like to go again, it’s quite difficult to face the rampant consumerism in its utter rawness, the last vestige of person-to-person shopping. And I definitely never want to look into a camera like that ever again.